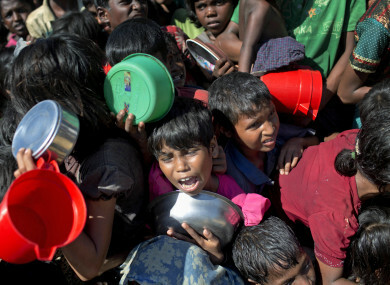 Rohingya children fighting to receive food handouts at a refugee camp in Ukhiya, Bangladesh. MYANMAR’S AUNG SAN Suu Kyi met with Bangladesh’s Foreign Minister this morning to hammer out a deal to return hundreds of thousands of Rohingya Muslims who have fled violence in Rakhine state, as global pressure mounts over the refugee crisis. More than 620,000 people have poured into Bangladesh since August, running from a Myanmar military crackdown that Washington said this week clearly constitutes “ethnic cleansing against the Rohingya”. The talks between Suu Kyi and her Bangladeshi counterpart come ahead of a highly-anticipated visit to both nations from Pope Francis, who has been outspoken about his sympathy for the plight of the Rohingya. The pontiff will join a stream of global leaders who have passed through Myanmar’s capital Naypyidaw in recent weeks to pressure leaders – including the powerful army chief Min Aung Hlaing – to resolve the crisis. Mainly Buddhist Myanmar, which denies committing atrocities against the Muslim minority, has agreed to work with Bangladesh to repatriate some of the Rohingya piling into desperately overstretched refugee camps. But the neighbours have struggled to settle on the details, including how many Rohingya will be allowed back in violence-scorched Rakhine, where hundreds of villages have been levelled. Last week Min Aung Hlaing said it was “impossible to accept the number of persons proposed by Bangladesh”. But talks continued today as Suu Kyi, who is in a power-sharing agreement with the military, met with Bangladesh’s Foreign Minister Abul Hassan Mahmood in Naypyidaw. They discussed about the development of cooperation and relations between two countries, to accept the people who left the places of Rakhine, and ongoing cooperation between two countries. Officials could not be reached for comment about whether a final deal was on the cards. The latest crisis erupted after Rohingya rebels attacked police posts on 25 August. Suu Kyi’s government has also vowed to deny visas to a UN-fact finding mission tasked with probing accusations of military abuse. Email “Myanmar and Bangladesh to sign deal to return thousands of Rohingya refugees”. Feedback on “Myanmar and Bangladesh to sign deal to return thousands of Rohingya refugees”.